AAAs kill approximately 10,000 people in the United States each year. Many of these deaths could be prevented if the patients were aware of the presence of this defect. Once the defect is recognized, the rate of operative mortality for a nonruptured aneurysm is less than 5%, and after operation, the survival rate equals that of the general population. An AAA that ruptures carries a mortality rate of nearly 90%. Even among patients who reach the operating room alive, the surgical mortality rate is 50%. The examination is performed by palpating deeply, but gently, into the midabdomen. The presence of a mass with laterally expansive pulsation suggests an AAA. Some caution is urged in making this diagnosis in thin individuals, in whom the normal pulsatile aorta can be easily palpated. 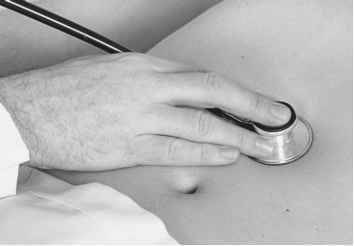 The high false-positive rate with this examination should not be a problem, however, because confirmation with abdominal ultrasonography is safe and inexpensive. Other findings associated with an AAA include an abdominal bruit, a femoral bruit, and a femoral pulse deficit. In fewer than 10% of patients with AAAs, a bruit may be present. Acute rupture of an AAA is suggested when a bruit is associated with severe pain in the abdomen or back and when the distal pulse is absent or diminished and later returns. Table 15-1 summarizes the physical signs useful for detecting an AAA.